Sublette was founded along the railroad that pulled into Haskell County in 1912 and was voted the county seat in 1920. The town took its name from William Sublette, one of the first entrepreneurs to engage in the business of hunting, trapping and trading in this county west of the Missouri River. The chief business of Sublette as it emerged as a progressive town was that of marketing grain, beginning with a portable grain elevator. Today, with the operation of several cattle feeding yards in the territory that prepare thousands of cattle for market, the grain industry has advanced to four untra-modern elevators with a capacity exceeding six and a quarter million bushels. The drilling of irrigation wells began in 1939 and irrigation has advanced to 325 wells irrigating 110,000 acres. Most of these wells are fueled with natural gas. Irrigation to assure winter wheat pastures that fatten young cattle aides in establishing a stable economy. In addition to the irrigation wells, five wells provide abundant fresh water for the town. 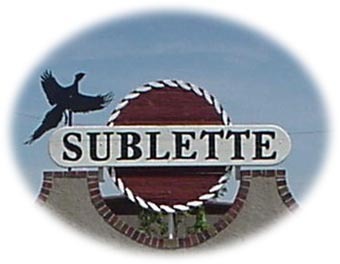 Sublette is proud of its paved and lighted airport which is open to all pilots. Abundant natural gas and fresh water as well as easy access to Sublette by rail, highway, and air makes the town an ideal place to live and develop any industry. The historic Santa Fe depot was the first building to house the Haskell County Museum . It was moved from the railroad tracks to its present location at the fair grounds where the museum has expanded its displays to the additional building. Although the chamber has no permanent office the members will give directions and help any visitor with information. look for these members. Jaaam-Dee Ricketts-- Lucas and Sons Auto Supply.-Kelman Farms--Bill Lower -Sublette Clinic branch-Heritage Feeders LP Sublette-Robert Orth-.